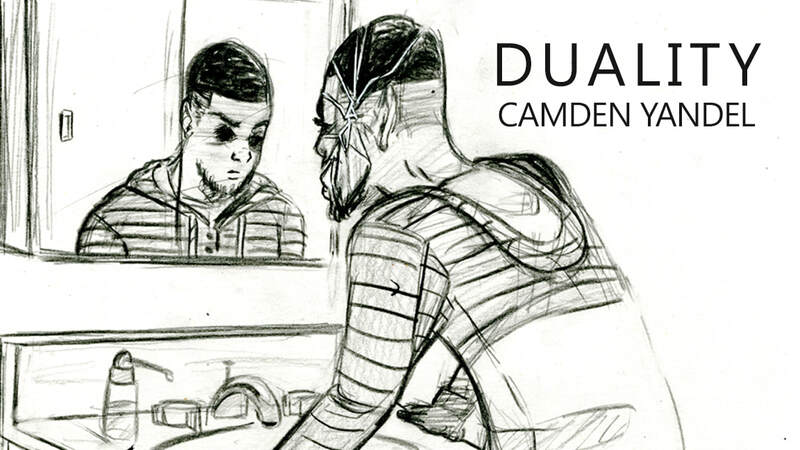 Join us for our November 2017 Opening reception with a new exhibition of work titled, Duality, from artist in residence, Camden Yandel. Pete and Freddie were best friends. They played video games, rode bikes, LARPed, and slew demons together. That is until a mysterious masked crow named Anzu came along to tear their friendship apart. Now as adults, Pete and Freddie must navigate life without each other while Anzu torments them. But what could he possibly want with these two? Duality is presented in the Bunker galleries in two forms: Camden’s original graphite drawings and overlaid red and blue prints that generate a dual narrative that reveals itself based on the color of the glasses worn by the viewer. The show also features a mural that draws from the Duality universe. This work deals with themes of insecurity and the fight, flight, and freeze responses to stress.